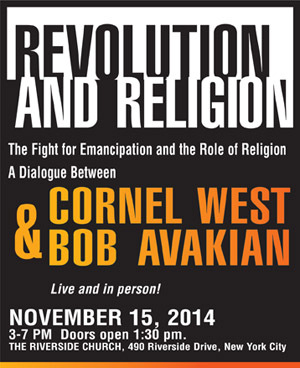 On September 1, we announced the Dialogue between Bob Avakian and Cornel West on “Revolution and Religion: The Fight for Emancipation and the Role of Religion,” taking place in New York City on November 15, at Riverside Church. Nobody with any interest in human emancipation should miss it. Bob Avakian has been fighting for the people for 50 years and leading the Revolutionary Communist Party, USA for nearly the last 40 of those. He’s taken the understanding of how to make revolution, and how to keep a revolutionary society on the path to full emancipation, to a new level. BA has come up against repression and suppression, and endured slander and sacrifice in doing so. And through all that time his deep commitment to the people has never wavered and, indeed, has grown stronger. Each has done very important theoretical work on the topic of the Dialogue—a topic that sits deep in the heart of millions, including many of those who will be the bedrock of any revolution inside the U.S. This is a Dialogue that will surely break new ground. That alone marks this as historic and not to be missed. Add to that the whole dimension of the rare chance to see and hear BA live and in person, to hear his message and get a real feel for the person behind the message—well, this truly is something unique. This is far from an abstract debate—coming in the context of today, at a time when intense struggle has erupted and more is in the offing—it is actually a pressing issue. This Dialogue can powerfully affect what people see as possible, and necessary. It can raise their sights far beyond the limits of today to the possibilities of tomorrow. Not least, it can join their deepest questions about what kind of lives are worth living. There are those who are already jumping at the chance to hear the Dialogue, and who are supporting it, and there will be many more. There are those who are already attacking it, and this too will intensify. So a Dialogue that speaks to and in many senses grew out of struggle will also involve struggle of different kinds. Through the course of this, the side that wants these two people to be heard, engaged, and defended must grow. We will be covering this throughout the next 10 weeks. In this issue, we are going to share some of the initial responses from people at the Labor Day picnics where this was announced; we are publishing a piece on building a big audience for this Dialogue within the communities of the most oppressed; and we will run excerpts from the announcement made at the picnic. Watch this site as the week develops for more important news and comment.